This week I want to talk about something that I do in fact hold very close to my heart: my slippers. Overall. and slightly off topic I admit, I have to say that slippers are completely underrated. They come in all different shapes and sizes ranging from small ones to big ones. I know – fantastic idea. There are also so many different designs. You could, for example, go for a pair that looks like a furry little animal or just a simple plain blue pair. 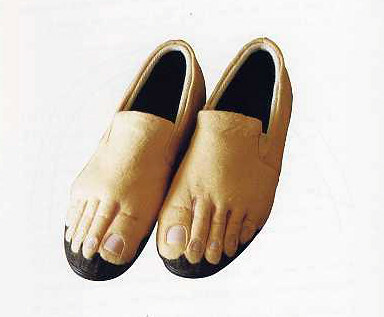 Or, if you’re really cool, go for a pair that look like feet. Now – back on to my main point about what should exist somewhere in the whole wide world. Warm-up slippers are my first idea for these wonderful devices. I’ve seen things like this but I’m not talking about slippers that you can put in the microwave to heat up before you wear them. I’m talking about slippers that you can actually switch on with a small electrical heater somewhere in the shoe. I feel that I could greatly benefit from this as I tend not to wear socks at home so, when my feet are getting a bit chilly, I could simply slip on a pair of electric slippers! Of course you’d have to sort out the safety features, and make sure they don’t set on fire, but otherwise I feel this could be a great invention. My next idea is for the people who normally clean up after themselves and have to do some sort of housework every now and again. 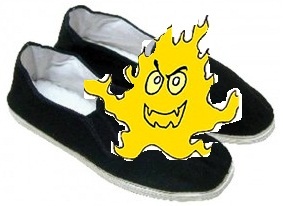 The idea is that you can magnetise the soles of the slippers, using some sort of magical thing that I don’t really understand, so that, as you walk around the house, in your bedroom, on your carpet or wherever, your slippers pick up any stray dust around the house. This would save you using a vacuum so often and it would be operated by a switch so that you can get rid of all the dust on your slipper and also so you can choose when to have it on or not. Also, I feel it would generally be very entertaining to see what you would be able to pick up, such as a pin or something. A brilliant idea that came from someone very close to me. They suggested a pair of vibrating or massaging slippers. These would be perfect for those people who just can’t get enough massaging. I don’t know how they would work, but I can just imagine lying down on a sofa or my bed watching something or playing on my Xbox/PS3 whilst my slippers rub my feet for just the expense of some batteries (assuming they’re battery-powered). That’s about it for this week and I hope you all go out now and actually value how brilliant your slippers could be, if you own a pair and sometimes bother to wear them.